By Amy Hoover. Published in Pilot Getaways magazine, 2002. 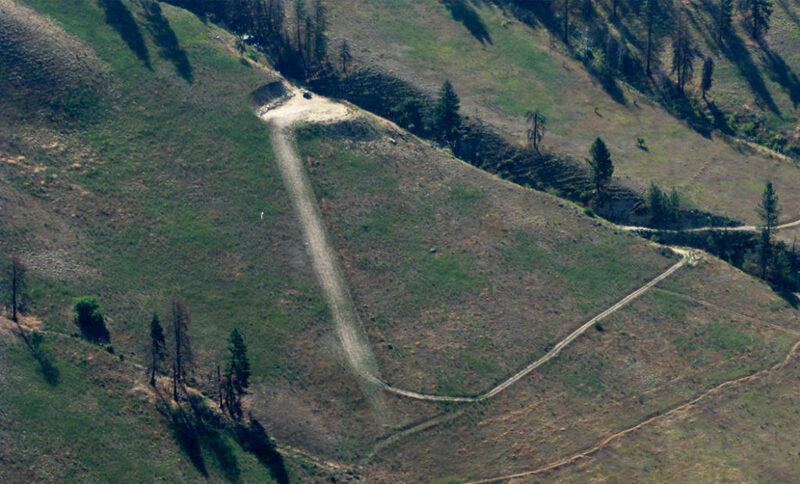 Airstrips located atop mesas, in hill country, in canyons, or along rivers may have a gradient varying from small to significant. Wind permitting, it is generally best to land uphill and takeoff downhill. 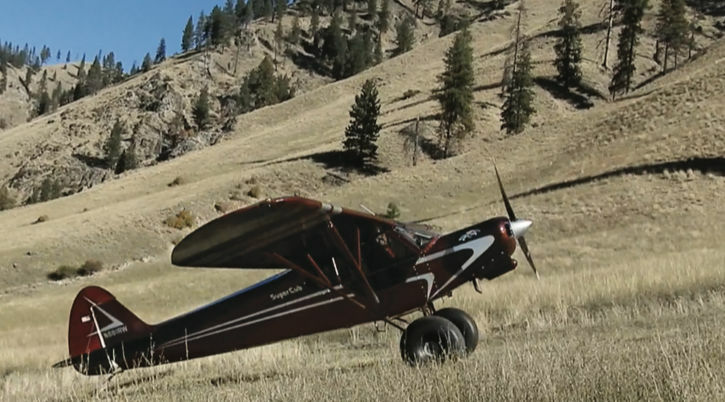 With a little practice, approach and landing to uphill airports can be accomplished without much difficulty, and most pilots find the ground roll delightfully short (landing uphill on very steep runways requires special techniques outside the scope of this article). However, as runways get steeper, shorter, and higher, planning for approach, landing, takeoff, and departure becomes more critical. Knowing the effects of runway gradient on takeoff and landing performance will give the pilot an extra safety margin, especially when deciding whether a takeoff would be prudent with a given aircraft weight, wind, and density altitude. It may not be possible to accurately judge gradient when checking out an airstrip from the air. This means information from airport directories or local knowledge gleaned from pilots familiar with the landing area is invaluable. Once on the ground, there is a way to calculate runway gradient using the aircraft altimeter and a little legwork. Here’s how: taxi to one end of the runway and read the elevation from the altimeter, then taxi to the other end and find the elevation there. The difference in elevation between ends divided by total length equals the gradient. If there is no published runway length, pacing off the strip can give a fairly accurate measurement. The pilot can then refer to the POH at the correct density altitude to see how much fish she can safely carry. If she took off uphill, or landed downhill, the runway would be effectively shortened by the same amount. Keep in mind that this is only a rule of thumb, and will vary depending on the thrust/drag relationship and weight of the airplane. Additionally, the gradient may not be uniform along the entire length of the runway, with some sections steeper than others. In an ideal world, pilots would always be able to land uphill with a headwind and takeoff downhill with a headwind. But what about the times when gradient and wind are in “opposition”? Which is best, landing uphill with a tailwind, or downhill with a headwind? Is it better to takeoff downhill with a tailwind, or uphill with a headwind? Let’s look at some of these scenarios. Planning to land with a tailwind should be done with caution. A 10% increase in groundspeed results in a 20% increase in landing distance, so that even light tailwinds can greatly increase the landing ground roll. If the runway ends in a drop-off, such as on top of a mesa or along a riverbank, and a landing is made with a tailwind, one should anticipate an updraft over the drop-off on short final. This updraft can cause the airplane to balloon or float further down the runway before touchdown, and could be problematic depending on runway length and gradient. Additionally, when landing with a tailwind the pilot will have to fly a steeper approach to compensate for increased groundspeed, which can cause visual illusions that hinder judgment of height and distance relative to a sloping runway. A strong headwind is required to overcome the increase in landing roll that a downhill landing creates; if the wind is strong enough to cancel the effects of a large downhill slope, expect a lot of turbulence on the approach, particularly if there are obstacles or trees. If the approach is flown at a faster airspeed to compensate for gusts and turbulence, the increase in groundspeed will lengthen the landing roll. Also, when landing downhill the plane will float, and float, and float. Pilots may find it hard to touch down because the ground keeps dropping out from under the airplane. Once on the ground the pilot is counting on brakes to stop (going downhill). Heavier airplanes have more inertia and can be hard to stop. Because a 10% increase in groundspeed increases the takeoff roll by 20%, and every 1.0% of runway downslope equals approximately 10% more effective runway, it takes about 1.0% downslope to counter every 2-3 knots of tailwind for most general aviation aircraft. Thus, a 6-10 knot tailwind would require at least a 3.0% downslope to neutralize the effects of wind. If the downsloping runway ends in a drop-off, the plane may become airborne or fly in ground effect, but will encounter a downdraft over the drop-off once it leaves the runway. Turbulence will often accompany this downdraft, and water will amplify it. This can be a sticky situation, especially when launching off a mesa or a strip in a river canyon. If no turns can be made and the departure must be flown with a tailwind due to terrain, downdrafts and turbulence may continue along the departure path. The only option a pilot has is to lower the nose and maintain airspeed. Based on the relationships of groundspeed and gradient, an airplane will generally require a significant headwind to counteract more than a slight uphill slope. If the runway is short, choose a takeoff abort point; if the airplane is not in ground effect and accelerating by that point it may not outclimb the gradient. Aborting a takeoff uphill provides more rapid deceleration and less distance than a runway without slope. Anticipate wind shear and turbulence over trees or obstacles after departure. Also, when taking off uphill, chances are the terrain beyond the departure end of the airstrip rises, and may exceed the climb capability of the aircraft. Use caution when mixing wind and runway gradient. Many times runways with gradient have surrounding obstacles and terrain that can exacerbate the effects of downdrafts, wind shear, and turbulence on approach and departure. On short runways, especially with obstacles in the approach or departure path, landing and taking off with more than a light wind may not be a good idea.